Hmm, it’s clearly obvious that these kids need to have much more schooling in Jersey culture. When we got onto the boardwalk, they didn’t know what to look at first. 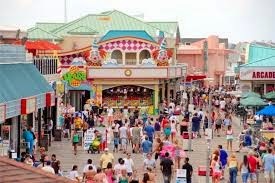 If you’ve never been to a Jersey boardwalk, it is most definitely an attack on all of the senses. Even though the aquarium is not large, it has enough attractions to hold the boys’ attention. They were most interested in the scuba divers, turtles, squid, jelly fish, poison dart frogs and of course the sharks. After the tour of the aquarium and a bite to eat, the kids wanted to know if they could go on the rides and go into one of the arcades. I told them they could pick one or the other. They chose the arcade. 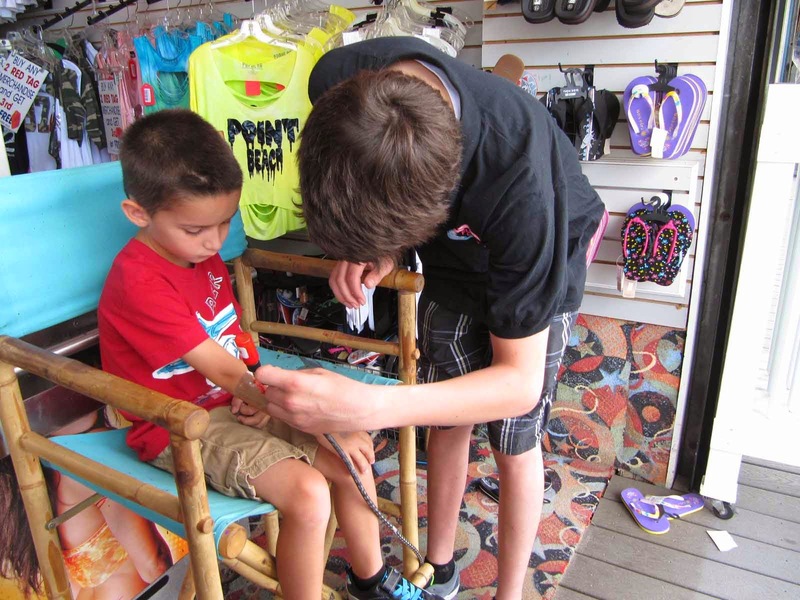 On the way to the arcade, they asked if they could each get a tattoo. Hey, we are the grandparents, we only get to see them a couple of times a year. Of course we said, “Yes you can each get a tattoo. 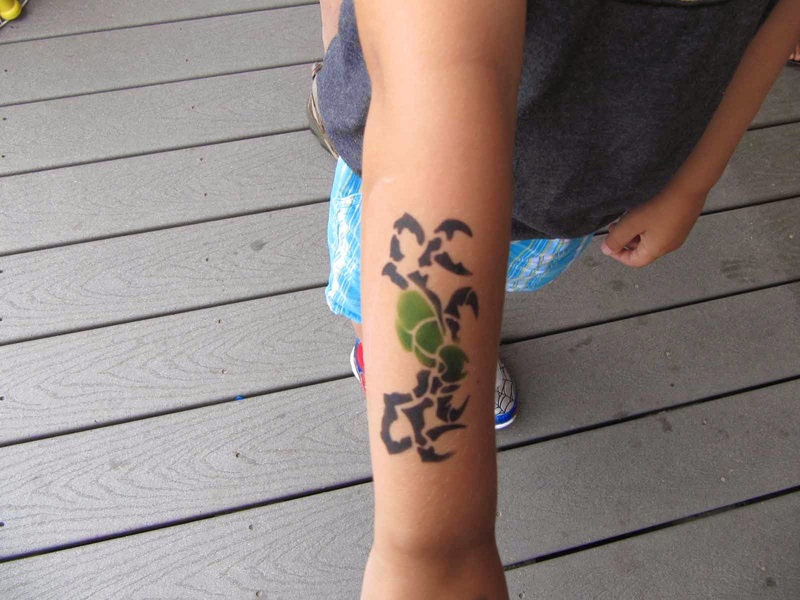 Do you want the red and black snake or the green tarantula?” Kenny chose a dragon and Ty picked the spider. 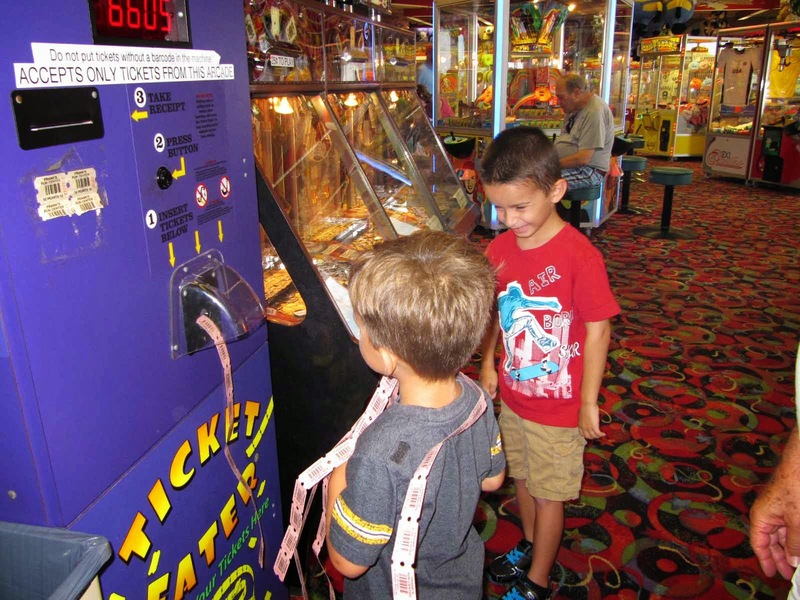 In the arcade, because they are only 5 and 6, most of the games were beyond their reach, both physically and mentally. But we did manage to find a couple they could play. They were thrilled when, whatever game they were playing, would spit out prize tickets. I tried my hand at ski ball and I managed to rack up a nice amount of tickets. After an hour we told them it was time to cash in our tickets so that we could redeem them for wonderful and exciting prizes. 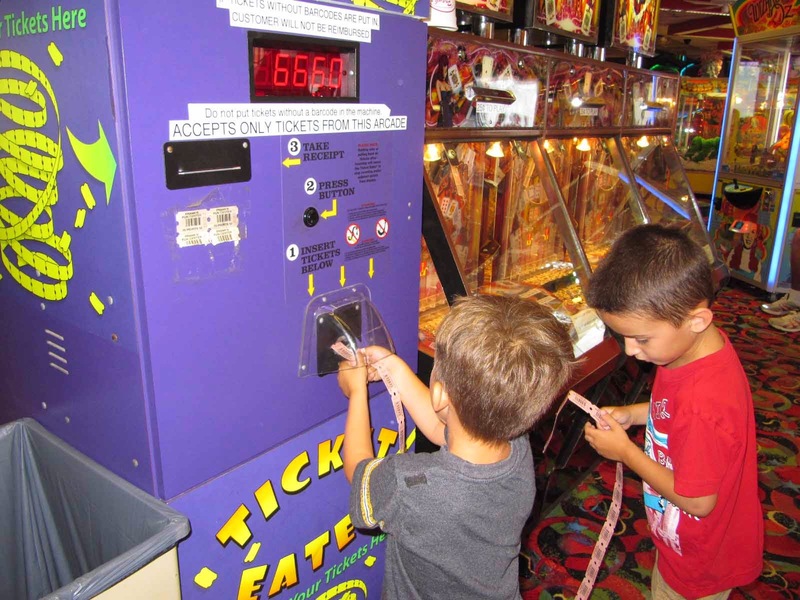 I think they got the most enjoyment from feeding the tickets into the redemption machine. Let’s see the prizes they picked were fake mustaches and green vampire teeth. Jimmy has off on Fridays. 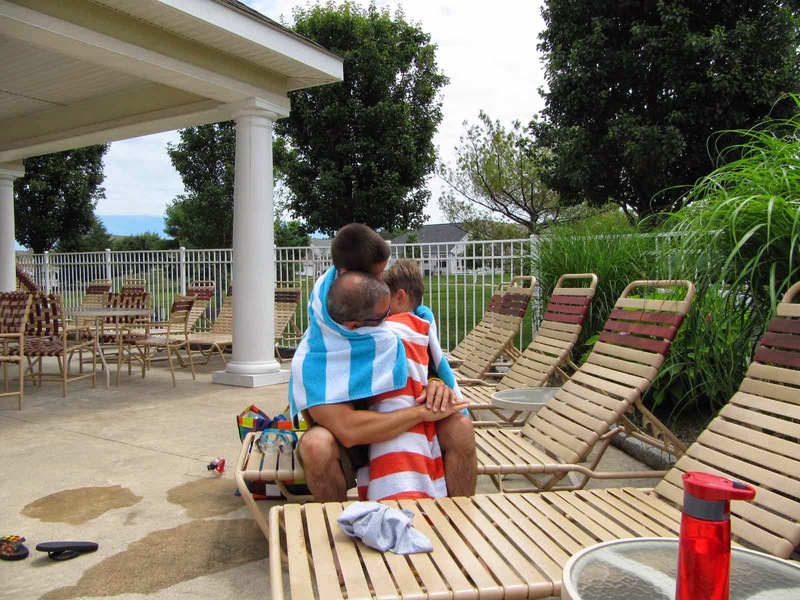 My heart is warmed to see him with his boys. So, Jimmy took the kids to his house for the weekend. We’ll get to have them with us again on Monday. Okay, yeah we admit it, we needed a little rest. I love the Dad and sons photo. It is precious! Enjoy the rest they will be rearing to go when they are back!! Yes,those photos are the best. We spent the weekend chilling out and we are ready for the next round. How cute with the boardwalk and aquarium; looked like a lot to see! That was great that you had the weekend to rest up and recharge your batteries for the new week! Yes, we did relax and rest this weekend. We’ll be picking them up soon. I like ski ball. Probably because you do rack up tix. You are SuperGramma. Yeah, you know I kinda do feel like SuperGramma. I'm a fan of the bowling game. Glad you all had a great time. The arcade was filled with those games with the crane and stuffed animals. You know you have to grab one and then maneuver over to the shoot. It’s nearly impossible to win that game. We steered them away from those.